Article published in the art magazine ETC Media #110, a special issue dedicated to the work of Gregory Chatonsky. Night Journey, one of the sixty fictional projects in Ilya and Emilia Kabakov’s exhibition The Palace of Projects (1998), invites the viewer to perform a simple experiment: “when night has fallen, and you remain alone in your room, sit down at your desk, turn out the light, and turn your desk lamp so that it illuminates only one small part of the desk.” By highlighting the presence of just some of the ordinary objects on the desk, while the rest of the room plunges into darkness, “suddenly a new mysterious world emerges, which you couldn’t have anticipated before.”  Both the NASA satellite image and the Kabakovs’ artistic project suggest that sometimes the absence of light is what lets us see more clearly. Even if something is in front of us in broad daylight, it may not be plain to see; but darkness forces us to pay attention to what may be hidden, and it lets us focus our gaze on what is illuminated, be it the layout of the city or a set of objects on a desk which turn out to be a little less ordinary. Night Journey also introduces the perception of darkness as something magical and mysterious, that spurs the imagination. In this sense, the darkness in Chatonsky’s work can be related to the perception of the computer as a black box whose inner workings we are unaware of. Darkness, or the nocturnal, is therefore used as a way to contradict the apparent transparency of Information Technologies. Computers and servers are presented as inscrutable or even ominous machines that are out of reach, as in Horizon (2016), or carry out enigmatic processes, as in L’Enclave (2013) or Memories Center (2014). They can also be part of what Chatonsky describes as a “background noise” that “structures our being in the world, our relationship with others and our process of individuation.”  In our daily interaction with various social networks, and the awareness of our online presence even when we are not online, this “background noise” is constantly present. Silence may only be found in the still of the night, when the screens are turned off and apparently no further activity is taking place (or is it?). Cinemas are among the very few places where most smartphones are still silenced or turned off. The auditorium, that Michel Foucault described as an heterotopia or éspace autre, yuxtaposes a real space and a fictional one in a single location . To do so, it requires the undivided attention of the viewers, which is achieved by darkening the room so that one can only look at the projection screen, as well as trying to prevent spectators from using any other screens. Chatonsky has referred to the use of black backgrounds and full screen displays in his online works as “a way to watch the Internet as in the dark room of a cinema, in this waiting and loss of oneself.”  Artworks such as Waiting (2007) or World State (2008) exemplify this sort of attention and consciously avoid any sort of interaction between user and artwork, as the viewer is meant to sit and watch while the fiction evolves by means of constant data exchanges on the network. Again, the machine (or the software) takes on a life of its own, leaving the human in front of it as a mere witness of its activity. However, the viewer is by no means inactive, since she is constantly trying to make sense of what she sees on the screen. Sleep is usually understood as a state of inactivity, particularly unproductive in terms of labor, although it is clear that the organism is active and the sleeper is producing, and being a spectator of, her own dreams. In consistence with his interest in the language of cinema and in automatically generated fictions, Chatonsky has explored the processes that take place in the subconscious mind at night. This can be seen in installations such as Sleepless (2013), which requires a sleeping person to generate an image that only a sleepless person can observe, and the previously mentioned Memories Center. The act of sleeping is therefore examined from a distance as well as recreated by means of a series of algorithms and a repository of human-generated content. In connection with the conception of the machine as an obscure being, it can be said that the artist plays with the idea of a subconscious state in the computer, an ability to dream which precedes rational thought. “Every night, for months, the computer calculates. During my sleep, while other images invade me in the nocturnal oblivion, pixels and text are displayed, fixed and registered. The monitor is off while the processor calculates equations of which I have no idea.”  In this manner, Chatonsky describes his use of the computer in his daily work, hinting at the agency of the machine and the relative uselessness of the artist, contrary to the Romantic ideal. 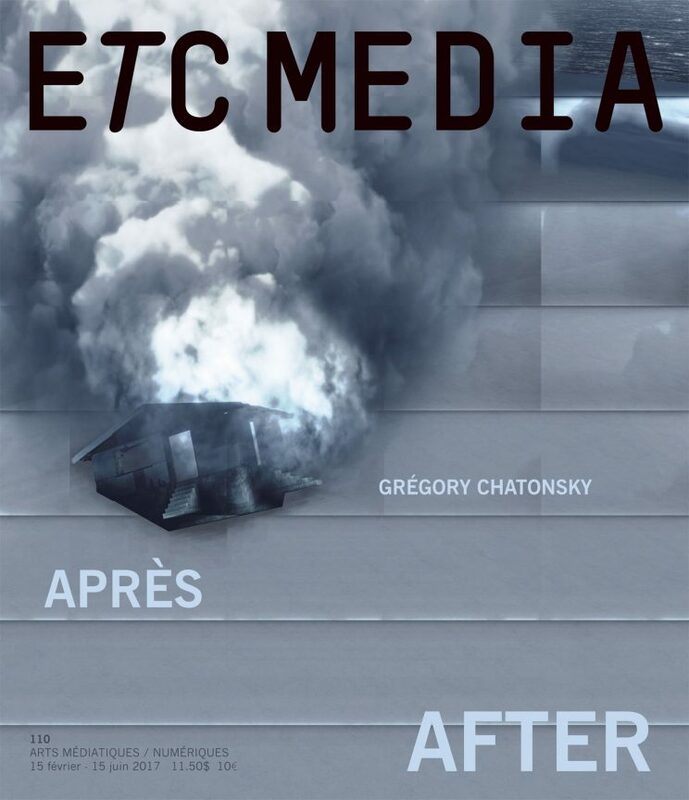 On several occasions, he has portrayed himself as a worker, for instance on the cover of the book Grégory Chatonsky: Capture (Orléans: Éditions HYX, 2010), which shows him in front of his computer at night, his face bleached by the glow of the screen, his features unrecognizable. This image, which brings to mind the experiment described in the Kabakovs’ Night Journey, suggests an endless and tireless production (from dusk until dawn), that is actually better carried out by a computer than by a human. When NASA and NOAA presented new views of Earth at night in 2012, researcher Steve Miller stated: “unlike humans, the Earth never sleeps.”  Neither do the networks of computers that form the Internet ever sleep. As Chatonsky points out, even when the monitor is off, the processor keeps working. And even when the computer is off, other computers are working with the data from the inactive machine. Capture (2009-) is an ongoing project that explores the possibility of overproduction by creating a system that never stops creating music, lyrics, artists biographies and music videos, beyond the human capacity to even read, view or listen to all the content that is being constantly produced. While it was initially intended as a form of criticism against cultural industries, it has evolved into an entity that is capable of producing culture without the need for a human audience. Just as a screensaver –a process carried out by the computer precisely when no one is interacting with it– signals the absence of the user,  the autopoietic activity of the machine can be interpreted as a prefiguration of the disappearance of humankind. Telofossils (2013) imagines the end of humanity in the form of a series of landscapes and objects that remind of archeological findings, only not of the past but of a possible future. Partly inspired by Cormac McCarthy’s descriptions of a post-apocalyptic world, it addresses a situation that we can barely conceive: our own disappearance, and the traces of our existence that we will leave behind. “Everything, according to entropy, is headed for ruin”, stresses Chatonsky. “We will disappear, we are mortal, the world will subsist without us.”  Exploring what may happen when the night falls on humankind implies moving away from the comfort of an anthropocentric view and considering the agency of the objects and machines around us. Like the view of the Earth at night, it allows us to see the world with distance and clarity, to overcome a self-centered perception of reality, and wake up. Capture. Generative Netrock. Enghien-les-Bains: Centre des arts d’Enghien-les-Bains, 2014, p.116. Capture. Generative Netrock. op. cit., p.240. Capture. Generative Netrock. op. cit., p.113. Art Taipei, 2013, p. 48.